There are few Nar cards that freezes opposing relics, so this card was created to fill that gap. 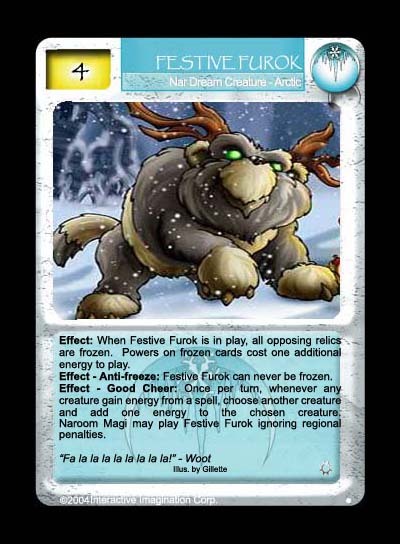 Essentially a dual-region card (like all dual-region cards in the set, there's only one template for each dual region card with additional text for the second region), this furok would work well in a Naroom setting as well as a Nar setting. The Good Cheer effect is the only drawback, but when facing cards such as Dagok, or when combined with Vim and Vigor it is worth it's while. The art is the Christmas piece from 2001 by Gillette from 2i.